Hey Guys, I need help on the proper etiquettes in attending the Scottish Highland games. My bloodline is of the Forrester/Foster/Forster lineage and I am part of the Clan Forrester, but when I attend these events shouldn’t I display my own Coat of Arms rather than the Clan Forrester badge or COA? Or would I display both in Unisonant to show lineage along with my personal identifier? I have made the possibly incorrect assumption that you will be attending these highland games in highland dress i.e kilt and bonnet. If you are attending in highland dress then you would not wear your coat of arms but would wear a bonnet badge. Which bonnet badge you choose to wear is, to a large extent, down to you but there are one or two ground rules. The first is that you would never wear two bonnet badges. Next rule is that your bonnet badge must not clash, of conflict, with your tartan; if you are wearing a Forrester tartan then you should either wear a Forrester clansman's crest badge (the chief's crest within a belt and buckle) or your own armigers badge (your crest in a circlet). You would never for example, wear a Forrester tartan alongside a McDonald crest badge!Personally I see no problem with someone wearing the tartan of their Clan along side their own crest badge and I have seen this on a number of occasions in Scotland. If you were in Scotland and you were a Scottish Armiger you would be entitled to wear one feather in your bonnet - I really would not like to dictate whether an American with assumed arms should or should not wear a feather at a Highland Games in the USA, it is your country not mine. I illustrate below my own armigers crest badge and the one worn by my son as a "follower". Thank you, I will not participate in the games but will participate in the whole lot of drink that will be going on. I do like the idea of wearing the Forrester tartan with my own crest badge and if it is acceptable I shall do just that. Personally, if I may, I feel that as Eagle Feathers were/are a mark of rank in Scottish Clan society,history and Tradition, for someone without Scottish arms or a Scottish matriculation to wear a feather would be incorrect. The purist may even find it offensive. I know that many other 'Scottish' armigers feel the same way. My use of the term 'Scottish' armigers includes any armiger with arms recorded/matriculated in the Register of all Arms and Bearings in Scotland. Some make the rules up as they go along RMD sort of springs to mind! If you are an armiger and wish to wear your 'armigers cap badge' with a Clan Tartan that your name is associated with, you are suppose to ask the Chief's permission to do so. Otherwise you should ware the Chiefs Crest in a Strap and Buckle to show allegiance to the Chief. Alternatively have your own Tartan as some of us do. Wild horses would not get me into a Robertson Kilt let alone wear his Crest in a Strap & Buckle. Location: Greenville, South Carolina, U.S.A.
Clan Forrester is currently without a recognized Chief, as the heir is the Earl of Veralum, who chooses to remain with the higher title (of course). Absent a Chief, there is no one from whom to obtain "permission" to use your crest badge. If you are going to American games, I would advise to just go ahead and wear your own crest badge unless you are participating in some official role in the Clan, in which case you really should wear the Clan crest badge. Games in Scotland would be another matter, and advice from a Scot would be welcomed. (BTW: I am former Vice-President of Clan Forrester Society; nice to see a comment from a cousin). Martin Goldstraw wrote: if you are wearing a Forrester tartan then you should either wear a Forrester clansman's crest badge (the chief's crest within a belt and buckle) or your own armigers badge (your crest in a circlet). You would never for example, wear a Forrester tartan alongside a McDonald crest badge!Personally I see no problem with someone wearing the tartan of their Clan along side their own crest badge and I have seen this on a number of occasions in Scotland. I must agree here. While wearing the clansman's badge is always correct, the wearing of your own armiger's badge along with your clan's tartan will serve to heighten your Chief as it adds one more armiger within his fold. J Duncan of Sketraw wrote: If you are an armiger and wish to wear your 'armigers cap badge' with a Clan Tartan that your name is associated with, you are suppose to ask the Chief's permission to do so. Otherwise you should ware the Chiefs Crest in a Strap and Buckle to show allegiance to the Chief. This is precisely what I did. As an American, I assumed arms of my own design. I then wrote to my Chief (my heritage is from Clan MacLeod). He was very approachable, and was happy to grant me permission to wear my crest within a circlet enscribed with my slogan and with one eagle feather. Since I only attend Highland events in the US, the jurisdiction of Lyon is moot. Even if I did make it to Scotland one day, it would be as a visitor and, as such, Lyon would hardly concern himself with my transient usage of an feather, especially with the expressed permission of my Chief. One gentleman on another forum when through a rather belabored process of signing a bond of manrent with his Chief and other such seemingly drawn-out processes to be "allowed" to wear his armiger's badge. I simply drafted a one page letter and included an image of my arms. It cost me no more than postage between here and Dunvegan Castle. I believe that gentleman is me! LOL! Yes in our clan all armigers must go through approval or the chief and his personal herald. Since I am not of the name MacMillan, I also had to go under a bond of manrent to the chief. All those who are not of the name have to do this to my understanding to be formally adopted into our clan. There was a little more to the process than this but I won't go into that as it is rather boring. The clan chief has sole authority on the usage of feathers. Lyon has stated so on several occasions. You may also wear your single feather with your chief's buckle and strap as laid out in a letter by Don Pottinger the Lyon Clerk in 1981. Since your clan does not have a chief I am not sure how that would work as that is the right of a chief to decide who shall wear feathers, even for those who do not have a grant or matriculation from Lyon. You are also correct that you may use your arms for non-commercial use up to 6 months in Scotland before having to register them with Lyon per Barrie Gourie of the Lyon Office. I believe in going straight to the horses mouth so to speak so I have spoken with Barrie on several occasions on different matters. He is a wonderful gentleman to deal with and a great help. Harold that letter is directed to a Scottish Armiger with a grant of arms from Lyon. He is not in a position to dictate to non Scots armigers. Yes in our clan all armigers must go through approval or the chief and his personal herald. The letter is there to show that you can use a feather in conjunction with your chief's crest badge. Some people think this is not allowed. Also feathers are allowed to be worn by the chiefs approval. This just shows that it is permissible with the chief's buckle and strap. Convention is that this privilege is extended to armigers but is still at the say of the chief. As per clan approval that is so that personal heraldry may be used in conjunction with clan activities. This is a process so that those armigers outside of the jurisdiction of heraldic authorities have a way to devise arms in a proper manner so that they may reflect well on the clan and chief. Since there is a great interest in heraldry in the United States, this will provide a way for armigers in the states to have and use their arms in conjunction with highland games and gatherings. Also the clan keeps an armorial record of all those who have arms in the clan either assumed, registered, privately registered, or assumed. 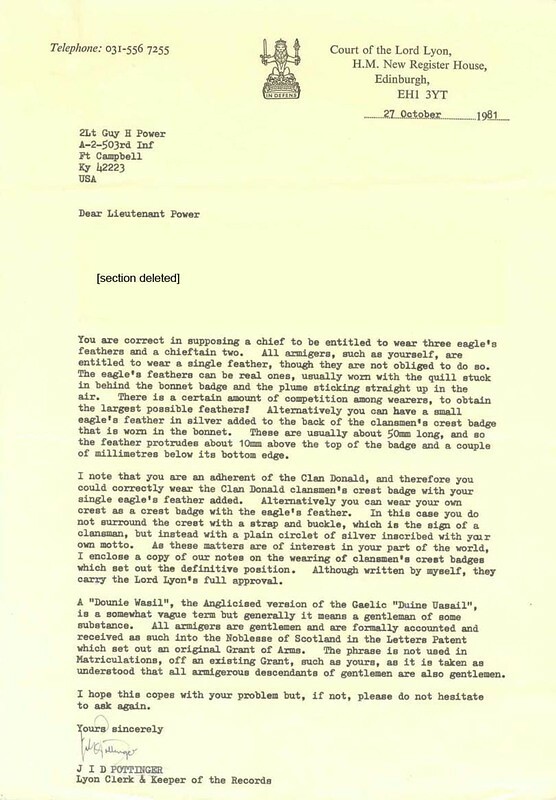 Harold Cannon wrote: The letter is there to show that you can use a feather in conjunction with your chief's crest badge. Some people think this is not allowed. Also feathers are allowed to be worn by the chiefs approval. This just shows that it is permissible with the chief's buckle and strap. Convention is that this privilege is extended to armigers but is still at the say of the chief. Yes a 'Scots Armiger' can if he wishes use a feather behind that of the strap and buckle badge of his chief or use his own crest either in a circle or a strap and buckle. A 'Scots Armiger' does not need a Chiefs approval to wear a feather behind his crest badge that is his right to do so. As for the rest quoted here and elsewhere, I think this is an attempt by certain people within the Clan Macmillan Society to circumvent Lyon Court. If you want to celebrate Scottish culture and heritage why try and manipulate things to suit an American style. In the USA you may well be in a position to assume or do as you please regarding such things but that does not make it right to do so. The idea is, as I said before, is to celebrate your Scottish Heritage and Culture not change the fundamental excepted perceived history of another countries heritage and tradition. This is not the first time this question has come up from Mr. Chapulin. It was thoroughly hashed out on the AHS forum some time ago. I know John and a few others were part of that discussion. The difference here is that as a citizen of the U.S. why would I should I be expected to pay thousands of dollars with the Lyon Court when it provides me no legal protection at all in my country. Even if I were to visit Scotland it would be quite fine to use my arms while there as long as they were not used in a commercial manner for a period of less than six months per Mr. Gorie. I am of Scottish and Irish heritage but as I can not fill a gap in my family history (due to the war of northern aggression) obtaining a matriculation from Lyon would be impossible. There are several people here in the states that have the same problem. If we are allowed to have arms at our decision should we be limited as to how we use them? I believe they should be formed in an acceptable manner as to composition and be used in a manner that reflects well on ourselves and in this case our clan chief since we as armigers of the clan represent him on these occasions. I don't see this as a way of bypassing Lyon. As a U.S. citizen I may have arms at my decision so why should I not be allowed to use them at highland games here or anywhere else. Just as if I were to attend an Irish function and we do have them here locally I am allowed the use of them there as well. Same with Native American functions as I wear my crest as a pin on my possibles pouch. To be honest I think our system of having our arms approved is a little overly complicated and could be streamlined a little. For a start Harold the post made here by Mr. Chapulin was made in May 2006. The question is not about whether you can assume arms or not Harold you are free to assume what you wish. The point is if you wear your crest in a circle styled badge with a single eagle feather to a highland games for example, you are making a statement that you are a Scottish Armiger which you are not. Likewise if you display a standard at a Highland Games you are giving the impression to others that you hold the Rank of Baron or Chief. You have to remember that there are also thousands of Americans who do have a grant of arms from lyon and are Scottish Armigers. I must also add I do not have a problem with people which have assumed arms as most will tell you. I will say that we shall agree to disagree on this. As an American armiger of Scottish descent, I would be uncomfortable with coming any closer than the unadorned display of my badge on my bonnet. The feather is reserved for the noblesse of Scotland, which my South African registry does not confer upon me. So if I ever were to take the next logical step in affecting Scottish dress at our local Games, I would content myself with my Scottish-inspired badge and leave feathers out of it (though I must confess that a single black pinion would be awfully tempting...but no). It can be difficult to know what to do here in the U.S., in these sorts of social settings. We are merely reflecting an aspect of our parent culture, often over-amplified and commercialized, and with so many different sorts of folk--most of whom are attempting to do the right thing, in their own ways. I suppose it's down to dressing and conducting yourself in a way that you are prepared to defend. This poor horse of a question has been resurrected & beaten to death more times than I can count, from rec.heraldry to the HSS forum to the AHS and here as well. I've run the HSS booth at the largest such Games on the West Coast for several years, and try to explain the Scottish customs to any visitors who are interested - but as information / education, and a little gentle guidance, not enforcement of foreign rules. That would be as silly as denying vehicle access to the parking lot unless the car was built and licensed in the UK, or barring the sale of shepherds pie or bangers that wasn't imported from the UK with a UK food inspection sticker. Even in Scotland short-term visitors are extended the "courtesy of Scotland"; and even if the Games in the States were treated as temporarily Scottish soil, visitors for the day would be entitled to that same courtesy.